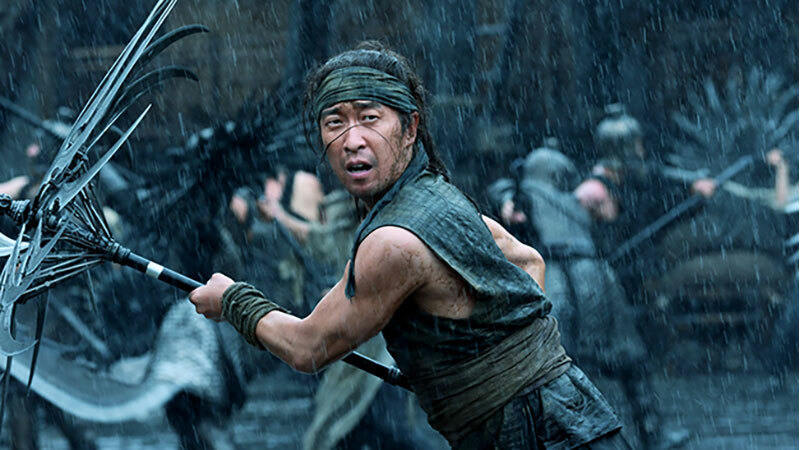 Fifth Generation director Zhang Yimou returns true to form with Shadow, which just flows across the screen with undulating fabric, hair, action, and editing, reminiscent of the likes of Hero and House of Flying Daggers. Based on the eponymous Romance of the Three Kingdoms, the title refers to Commander Yu (Hu Jun, John Woo’s Red Cliff), really a peasant, who doubles for the sickly Yu, a crazed master who works in collusion with his wife. There’s lots of “Dallas in the Palace” in this intrigue, and even if audiences are unfamiliar with the saga, there’s enough exposition, effortlessly handled, to bring us up to speed. All the tropes of an action drama are here: difficult taskmasters and dedicated practice, phenomenal swordplay, unusual weaponry (umbrella weapons literally float down a mountain), jealousy, intrigue and revenge, and a bamboo forest allusion. The title also alludes to its dark palette and vision— “power games and war never tasted the beauty of the world.” Well, Zhang gives us beauty but also raises the lantern with issues about contemporary China worth consideration.